You could go out and buy a big expensive water filtration system. But that's not always practical or affordable. 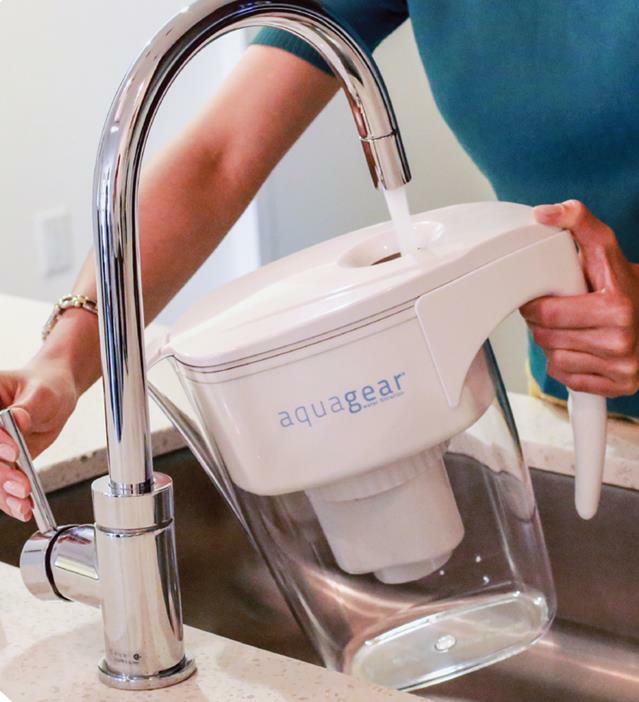 If you're looking for an inexpensive but effective way to filter your tap water, you'll want to consider the Aquagear water filter pitcher. It's well-designed and makes water taste clean and fresh. Best of all, it's excellent at reducing contaminants that plague our modern water supplies - things like lead, chlorine, fluoride, and chromium-6. I've done a good bit of research on it, and I've also had the chance to try it out for myself. In this review, you'll read what I learned about how it works and why I recommend it. I hope it'll help you decide if this is the right water filter for you. Click here to check the price at the Aquagear website. (That's where I recommend buying it, and I explain why below.) Get a 15% discount off your purchase by using coupon code thesafehealthyhome15. If you're crunched for time, you can click on a specific question in the quick navigation below, or scroll down to read the whole review. What are the key features of the Aquagear water filter pitcher? What contaminants does Aquagear reduce? What does the Aquagear filter NOT remove? How does Aquagear compare to other pitcher filters? Where can I get a good price on the Aquagear system and replacement filters? The Aquagear pitcher uses a single filter composed of activated carbon from coconut shells and ion exchange materials. reduces a huge array of contaminants, including chlorine, VOCs, lead, and fluoride. This is where Aquagear outshines most of the other pitcher filters out there. Further down you can read more specifics about what it removes from your drinking water. There's nothing complicated about this filter system. First, you flush the filter element with water using the attachment that comes with it. 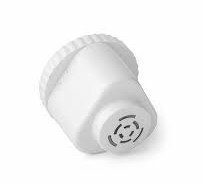 Then you screw the filter onto the bottom of the reservoir, place the reservoir in the pitcher, and fill it up with tap water. On top of the lid, there's a hole with a flap that allows you to fill the reservoir without taking off the lid. This is a nice feature that saves time and prevents spills. The water passes through the filter, and within minutes, you've got a pitcher full of clean fresh-tasting water. It took 4-1/2 minutes to completely filter the full 8 cups when I timed it. You don't have to worry about the pitcher itself contaminating your water. It's made of BPA-free, FDA-approved food grade plastic, and it's 100% recyclable. You can also send your used filters in to Aquagear to be recycled. There's a return mailing bag included with each new filter, and they'll provide you with a postage-paid return label. You just have to email them to request the label. Overall, my experience using the Aquagear has been great. I haven't had any problems with it leaking or with the spout flap getting stuck. I'm pleased with how quickly it filters and with the clean fresh taste of the water. In fact, I took it along to the beach, where the tap water smells and tastes like a combination of chlorine and swamp water. The Aquagear completely took that away. It was like drinking spring water! Some online reviewers have said that the filter starts out fast, but then it slows down after a few weeks. That hasn't been my experience, but it does happen to some people for various reasons. If that happened to me, I'd contact customer support. I hear they're responsive and helpful. Aquagear does a great job of reducing or eliminating many of the most common (and dangerous) contaminants found in drinking water. This filter has been tested by independent labs for more than 15 years to NSF Standards 42 & 53. That means you can be confident that it performs as advertised. You can read the complete lab test results at the manufacturer's website. 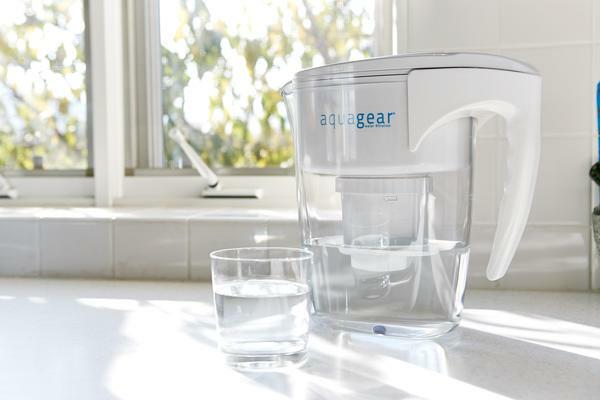 Like most pitcher type water filters, Aquagear is intended to be used only with treated water. That means either a public water supply or well water that has been disinfected. That's because the type of filter it uses does not eliminate microbiological contaminants like bacteria and viruses. If you want a filter that does remove them, you'll need something else, like a reverse osmosis system, gravity filter, or a distiller. It also doesn't remove healthy minerals from your water - but that's a good thing! Each filter is good for 150 gallons, or about 6 months. This can vary based on the quality of your water, though. The filter absorbs contaminants as the water passes through, and eventually it gets to the point where it can't absorb any more. When the flow slows down to a trickle, you'll know it time to switch out the filter for a new one. If it seems like the filter is slowing down before it should, you can try flushing the filter again. Sometimes that helps to restore the flow. The box it comes in says that it holds 8 cups (1/2 gallon), but it actually holds a little more than that. I put 9 cups of water into it, and you can see that the level in the pitcher was still below the maximum fill line, which is the bottom of the reservoir. Be careful not to overfill it, though, or it might overflow. You also want to wait until it's done filtering before you pour any out, to avoid spilling out unfiltered water. The Aquagear filter is better than most in terms of contaminant reduction, filter life, and overall design. Please see my review of the best water filter pitchers to see exactly how it matches up with ZeroWater, Clearly Filtered, Pur, and other popular brands. Aquagear products are only sold online at this time. And from what I've seen, they're only available at a few places. I would recommend buying directly from Aquagear. Because when you do, you can also get a 20% discount on replacement filters through their filter subscription service. This is only available at the manufacturer website. And, last I checked, they have free shipping, and they accept major credit cards plus PayPal. You can check the price and get all the details here. AquaGear coupon code? Yes, please! If you don't want to subscribe right now, use coupon code thesafehealthyhome15 for a 15% discount off your purchase. This code may be used once per customer. Aquagear offers an amazing Lifetime Guarantee on their pitcher. If it breaks or has some sort of defect at any time, they'll exchange either the bad part or the whole thing. This guarantee is way better than any other pitcher that I've seen! You can also try it for 30 days risk free, if you buy it directly from Aquagear. You can return it for any reason, and they'll give you a full refund, including return postage. Drinking water that's free of contaminants is important for your health. Unfortunately, most tap water these days doesn't fit the bill. The good news is that you can do something about it. 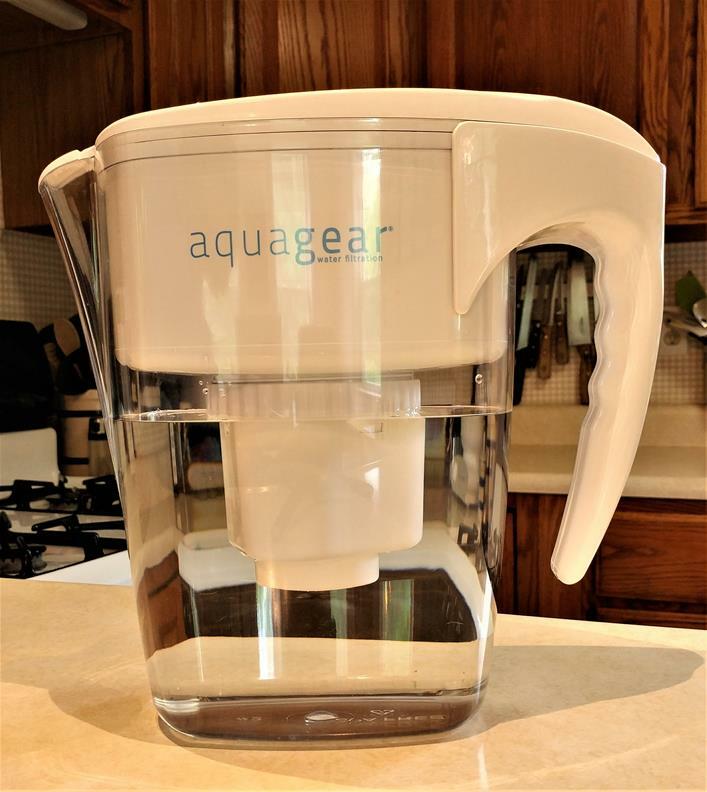 The Aquagear water filter pitcher is a great solution (with the caveat that you should only use treated water in it). It's highly effective for reducing contaminants, it's durable, and it's affordable. And Aquagear stands behind their product with a lifetime guarantee and no questions asked 30 day return policy. No risk! You can get one for yourself today. Just click here to go to Aquagear. Disclaimer: I was provided with a free pitcher filter in return for my honest review. All opinions expressed herein are my own and not influenced by the manufacturer and/or its affiliates, in any way.